Common but easily treatable side effects of Celebrex include sore throat, stuffy nose and headache. More serious but rarer side effects include fainting, hearing loss and depression. Celebrex has also been known to cause severe allergic reactions in some patients. Clinical studies have shown that the most common of these side effects are heartburn, diarrhea and stomach pain. All of the common side effects listed are relatively minor and either require no treatment or can be easily treated by the patient his or herself. However, if any of the side effects persist or become bothersome, contact a doctor. Patients with a history of stomach ulcers or gastrointestinal bleeding are particularly at risk for digestive problems or black, tarry stools. They should be particularly vigilant for these side effects and need to call a doctor at once if the side effects develop. Patients with a history of other conditions or currently suffering from certain conditions are also at greater risk for developing Celebrex side effects. Before starting Celebrex, patients should tell their doctor if they have a history of ulcers or bleeding in the stomach or intestines, have high blood pressure or heart failure or have kidney or liver problems. Patients who are breastfeeding should also inform their doctor of this before being prescribed celecoxib. Celebrex users who have heart disease have an increased risk of heart attack or stroke. There are some circumstances in which Celebrex cannot be taken at all. Celebrex should not be taken by a patient who has had an asthma attack, hives or other allergic reactions with aspirin, other NSAID medicines or certain drugs called sulphonamides. If a patient isn’t sure if a medicine they’ve had an allergic reaction to is one of these drugs, he or she should ask a doctor. The drug should also not be taken to relieve pain immediately before or after heart bypass surgery. Women in the late stages of pregnancy cannot take Celebrex. Many Celebrex users have no side effects but, as is the case with all medicines, some people will. The most important thing is to be vigilant for symptoms of celecoxib side effects and contact a doctor if at all bothered by minor side effects or if serious side effects develop. 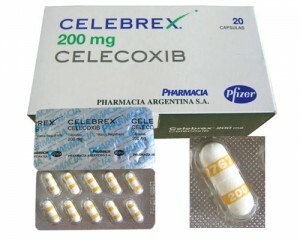 As with all medication, Celebrex should always be taken as prescribed by a doctor to minimize the risk of side effects.